We kicked off with Shai Berger of Fonolo, talking on “New Platforms for Customer Service Communications: Who Benefits?” One of the important questions raised is all the companies based on the Twilio:Amazon stack has resulted in a wave of disruption across enterprise telecoms with consumption based pricing, much lower per-seat pricing, and enterprises being in greater control. But are we ending up with a General Motors problem, where differentiation will be difficult given the common underlying platform. We’ll be discussing this more at TADSummit Americas 2019. Thomas leads the machine learning meetup group in Fort Lauderdale, and has been working in programmable telecoms his whole career. He provided a great summary of the state of play around speech recognition, language modeling, and sentiment. Currently the interfaces are constrained, though performance is improving rapidly. However, Thomas raised critical issue on the expertise required to make these technologies work today. Always-on the line assistants: transcribing calls, taking actions, providing whispers to group members; has been a vision for the conferencing industry for several decades. We’re getting close, however the price points are still high because of the expertise required to make this work, but it’s getting democratized fast as Thomas explains. Paul provided an excellent presentation on “Will Conversational Interfaces Eat Telecoms?” Always entertaining and thought-provoking, Paul’s company Webio, conversational middleware, is deploying conversational interfaces today across customers like Shop Direct and Zinc Group. The 3 layers of connectivity (across multiple messaging channels), automation, and machine learning are important steps in solution development. While the focus may be on the ‘hot topic’ on machine learning, the basics of connectivity still requires much work. Facebook and Whatsapp are not easy to work with. Automation is where I see most deployments today, as Paul’s examples show. Clearly using the constrained channel of text messaging, addresses some of the expertise issues Thomas Quintana raised in his presentation. Wrapping up the session Thomas Howe, CTO Ten Digit Communications, presented on “Simply adding SMS to your CRM won’t solve your customer interaction problems.” Thomas has been working on the adoption of SMS for customer interaction for a number of years. He’s very much on the sharp end of this emerging business. Thomas explains how history makes us look at customer interactions all wrong. Highlighting how perverse an IVR is for some tasks. For me the critical point Thomas raises is most smartphones (in developed markets) have 4 things – voice, sms, camera and mobile browser. It’s the mashing up of those 4 things that creates powerful capabilities across: authentication, document delivery, cheap augmented reality, and secure chat. Thomas then went on to give some use cases and deployment examples across his customers. Thomas’s point is similar to Paul’s on the base layer of connectivity. And Thomas focuses on what the capabilities on the smartphone mean from a business processes perspective. 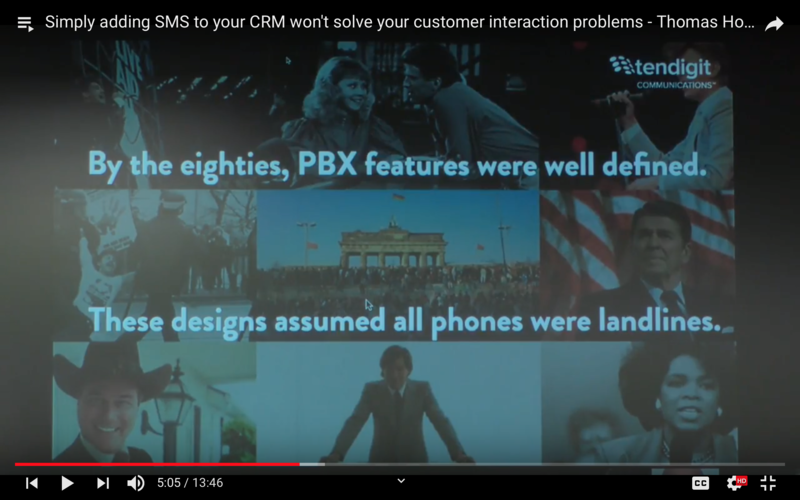 This presentation really does show we’re only scratching the surface of what is possible in customer interactions, and how its important to re-assess what is possible and not necessarily increment on traditional methods of customer interactions.